In the years Wilfrid Laurier University Associate Professor Marta Marín-Dòmine has been reading testimonials by and listening to interviews with Holocaust survivors, she has noticed one detail mentioned repeatedly. There were no birds. Or at least, the survivors couldn’t remember seeing or hearing any birds at Auschwitz-Birkenau or in the other Nazi camps. And yet, a Nazi ornithologist, Günther Niethammer, was working right nearby. “He was sent to work at Auschwitz and during his spare time, according to him, he birdwatched in the area and managed to catalogue 127 different birds,” says Marín-Dòmine, director of Laurier’s Centre for Memory and Testimony Studies. Were there actually no birds at the concentration camp? Hard to say – and, says Marín-Dòmine, not that important. 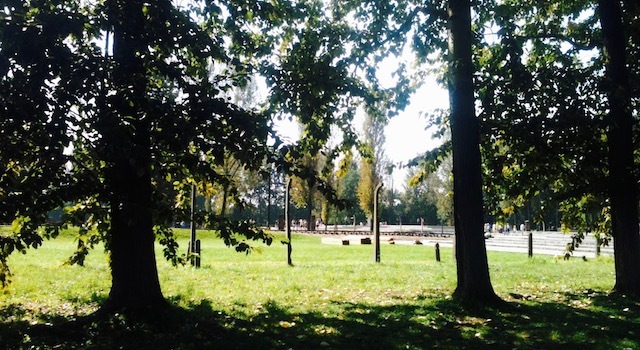 Regardless of whether birds were driven away by the smell of the crematoria – another common thread in survivors’ memories – or whether the despair of the camp prevented prisoners from noticing birdsong, the inmates had a common experience. “You don’t need to know if it is true or not. It’s a metaphor. It expresses for them the horror of the experience,” says Marín-Dòmine, who teaches Languages and Cultural Analysis and Social Theory. Now Marín-Dòmine has produced an art installation that symbolically returns birds to Auschwitz-Birkenau. 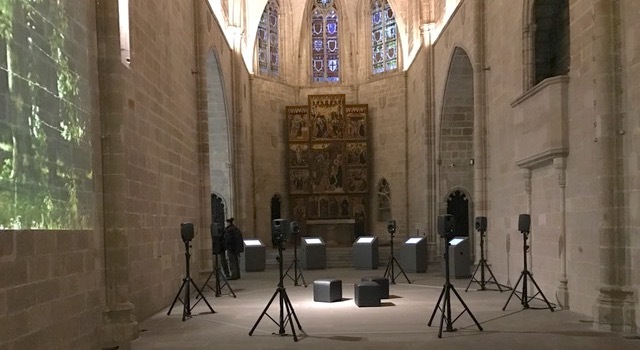 The installation, which is on now at the deconsecrated Chapel of Santa Àgata in the medieval quarter of Barcelona, is called Je vous offre les oiseaux / Us ofereixo els ocells, which means “I Offer You the Birds” in French and Catalan respectively. Right from the title, most visitors are presented with at least one language foreign to them, which conveys a sense of the difficulty inherent in a memorial act, says Marín-Dòmine. As visitors walk in, they see at floor level iconic images of Auschwitz-Birkenau and start to hear birds recorded on site at the camp, now a memorial museum. Further in, people see less well-known images of the camp, photos by Blai Tompàs that at first appear to be ordinary landscape, which may or may not convey something of the sinister. The heart of the installation is a circle of eight speakers among which visitors can wander to hear birds. There are multilingual explanatory panels and screens with information about the camp, the birds, the ornithologist Niethammer, and Marín-Dòmine’s personal experiences of visiting the camp. There is also an opportunity for visitors to “offer a bird to the past” by touching a screen, which produces a particular bird’s song. These visitor-generated bits of birdsong are stored and will be used by the sound artist, José Manuel Berenguer, in a new piece of music that will début on the closing day of the installation, April 28, 2017. The closing-day activities will also include two actors reciting fragments of testimonial literature about the lack of birds at Auschwitz. 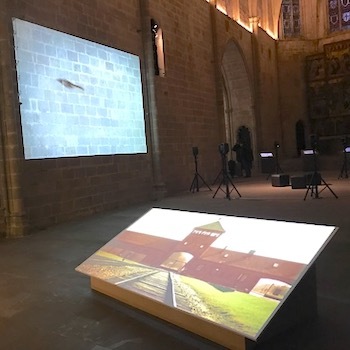 Although Marín-Dòmine has no direct or familial connections to the Holocaust and although as far as she knows, none of the elderly survivors have visited the installation, her years of working on Holocaust memories have convinced her of the importance to all humanity of remembering it. Similarly, it’s important for all people to remember other atrocities such as the Rwandan genocide and residential schools in Canada, she says. Marín-Dòmine has produced a couple of films, as well as numerous academic publications including the first English-language translation of K.L. Reich, by Joaquim Amat-Piniella, a novel based on the author’s experiences in a Nazi concentration camp. However, this is her first art installation. She has been surprised by the extensive news coverage it has garnered in Barcelona. In the future, she would like to take the installation elsewhere – perhaps to Laurier. She is also working on producing another art installation, this one about the Spanish exiles in France during the Spanish Civil War.